Here we go. Barack Obama vs. Mitt Romney is now in the hands of me and you and a boy named Sue. We'll be tweeting throughout the day and likely deep into the night on how television is handling judgment day. MSNBC will be the official Obama network while Fox News Channel plays up Romney's chances. That leaves a lot of networks somewhere in the middle -- at least compared to these two. The above electoral projection maps give you something to mull. One is based on an amalgamation of polls. The other is from Karl Rove's website, with the former George W. Bush orchestrator not surprisingly picking Romney to pull it out. The biggest difference in these two polls? It's Ohio. 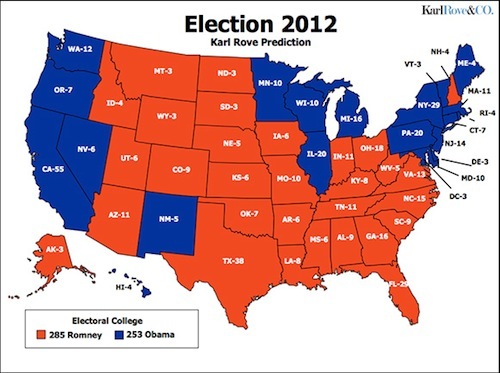 Rove gives the Buckeye state to Romney while the consensus favors Obama. The only other disparity is Iowa. 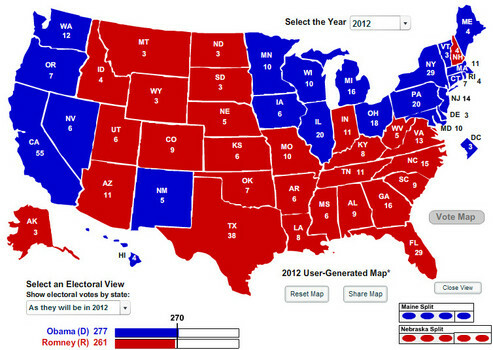 Give Romney those two states and he moves from a losing 261 electoral votes to a winning 285. So place your bets. Will any of the other handful of "battleground states" -- Wisconsin, Pennsylvania, Florida, etc., -- have different outcomes than both of these maps project? And will any of the networks make a projection they're later forced to take back? Gotta love democracy. Now if only they'd scrap the long-antiquated electoral college and make everyone's vote weigh the same.